It is impossible to imagine a business without a website. Online presence is not an option for organizations today, but a necessity. Without a website, businesses cannot interact with customers or target potential clients. In this tech savvy generation, most of the customer's purchase is made through search engines. So if you do not have an online presence or a website, then you are losing your business to your competitors, who, otherwise have an interesting website displaying their products and services. Merely having an online presence is not enough, the way your website is designed and how easy it is for customers to navigate in it is also significant. The content of your website should look professional and organized. Customers should easily find what they are looking for on your website, since they are becoming less tolerant to bad design and usability. Businesses that do not have a polished website risk are unable to attract potential customers on the Internet and in their storefronts. Customers are assessing products and companies before they decide to make a purchase, and if your website does not seem professional or secure, they will simply move on to the next vendor. Website designing is becoming extremely necessary in this competitive market. You can hire Web design services help your business create a structured and attractive website that offers a top-notch customer experience. Earlier businesses used to have two versions of their website, one for computer and other for mobile. But since two separate versions are time-consuming and require high maintenance, you can now have a responsive website that is ready for all devices. Today, customers are not only using their computers or laptops to access your website, they are making use of devices like mobile phones and tablets too. So you need a website that is accessible from any device. But how is this possible? Responsive websites are your answer. 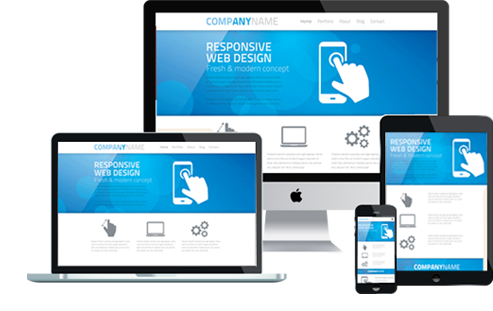 As Web design company based in Hyderabad, we help you make your business website responsive across all device platforms. As the website design company in Hyderabad, we offer services pan India. With the rise in the popularity of mobile phones, it is a huge disadvantage if your website is not designed to respond and adjust to mobile phone and other devices. At Aakruti Solutions, one of the finest web designing companies in Hyderabad, we mold your website design for enhancing its user experience to user's gadget -desktop, laptop or mobile. These websites will increase the user experience and reduces the bounce rate and finally helps your business in gaining leads. While using any other devices such as mobile or tablet, the customer may expect similar kind of experience like on a laptop or computer. A customer always looks for a website that has wonderful graphics, is easily readable content and navigable. Almost similar kind of design can work for your business and also help you to increase the website traffic. This is the main advantage of our Responsive website designing services. We are the best web design company in Hyderabad. We, at Aakruti Solutions are involved in designing and developing innovative Responsive Websites for your business that assure high conversion rates and website traffic. We are a team of professional and skilled web designers in Hyderabad that create customized Responsive Website Designs applications, which furnish your innovative requirements. Being a company that offers the best responsive web design services in Hyderabad, we develop websites at affordable price along with extensive knowledge, experience and quickness. Responsive website development is a new concept but the growth of technology is quickly making it an essential part of every business procedure for wider reach and exposure. Our website design services in Hyderabad will keep you ahead in competition. Even Google recommends websites that are responsive. Providing exceptional responsive web design services in India, Aakruti Solutions offers comprehensive web design packages that leave nothing out. Our affordable pricing and packages are hard to come by if you are looking for quality. It is difficult to find a web design company in India, that can match up to our pricing, packages and quality. At Aakruti Solutions, we develop completely customized website as per your requirement for your business. We offer services for website design in Hyderabad and all over the globe. So why should you choose us when you have thousands of options available in the market? Our talented team of experts takes your requirements as a challenge and delivers it 100%. We have an excellent track record of delivering projects on time, are cost effective and offer perpetual customer support to all our clients. So if you are looking for high quality responsive web design services in Hyderabad, your search ends at Aakruti Solutions.